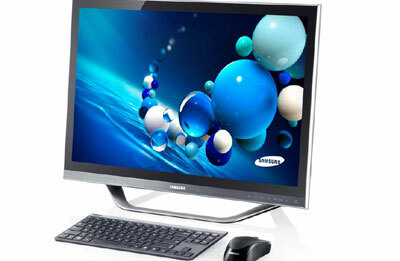 Samsung Electronics launched its all new All-In-One (AIO) PC Series 7, which boasts of powerful performance packed in a stylish slim design at the IFA electronics show in Berlin. Unveiling the new series, Seongwoo Nam, the executive VP and head of the IT Solutions Business at Samsung Electronics said, "The All-In-One PC market carries enormous potential to grow by taking convergence technologies to the next level." “The new All-In-One PC Series 7 lives up to the true promise of all-in-one, incorporating every hardware and software feature that offers a maximized home entertainment experience,” explained Nam. Building on the premium aspects of the Samsung Series 9 Notebook, the new (AIO) PC inherits Samsung’s advanced engineering craftsmanship with highly finessed and stylish design, he stated. Beyond high performance, the new AIO PC Series 7 has been crafted to deliver an entirely new AIO PC experience, he added. Driven by a third generation Intel Core i7 processor, 8GB RAM, dedicated AMD Radeon HD graphics and a WQHD display with resolution of 2560×1440, the new series embodies innovative sense recognition features such as 10-finger multi-touch screen control and hand gesture commands. "With the upcoming new Windows 8 platform, demand for All-In-One PCs is expected to increase further as AIOs will have stronger as well as more convenient features, and are expected to largely replace the existing desktop PC, said Nam. "To provide such user benefits, Samsung has perfected not only the AIO’s hardware but also its software aspects to offer completely new experiences," he stated. "For an unlimited premium user experience, the AIO has been equipped with a 10-finger multi-touch screen – a technological leap in interactivity, surpassing traditional two-finger multi-touch by providing full touch control using all ten fingers," he noted.